If you have functional drinks and need a bottling company to help you meet consumer demand, we are here to help. We have a 76,000 square foot facility with five liquid filling rooms and an air conditioned warehouse, ready for production. 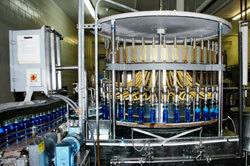 As a premier bottling company, we work closely with you and your staff to design the optimal production run. We make sure to identify your production requirements at the onset of engagements, so that we meet or exceed your expectations every time you place an order. We also pay close attention to quality, making sure to minimize production defects and costs, which will increase your customers’ satisfaction and your sales. Functional drink manufacturers differ in their production capabilities, making it important for you to select a service provider with the right attributes. You want to look for beverage manufacturers that have a quality program, because they will be able to provide higher quality products on a more consistent basis. You also want to work with a company that uses the latest technology, so that you can get your products quicker than your competitors. To learn more about our bottling processes and how we can help you enhance your business, please contact us today. We ready to help you take your functional drinks to market and support your operations.